I highlighted the ASC contact because the ASC symbolizes the start of a matter, in this case, the actual flight. Furthermore, recasting the chart for the town of Digne-les-Bains, France, I calculated that the ASC changed from Gemini to Cancer at 10:49:29 AM in that location. 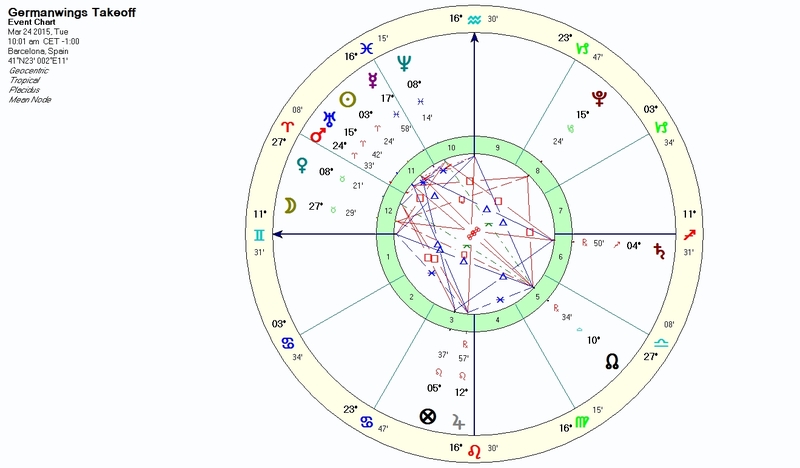 This means that at approximately 10:50 AM, the ASC shifted from Gemini to Cancer, changing the rulership from Mercury to the Moon, which was in the 12th house (self-undoing) and conjunct the malefic fixed star Caput Algol (losing one’s head). Three minutes later all contact with the plane was lost. This entry was posted in Astrology and tagged caput algol, Germanwings, plane crash. Bookmark the permalink. The fixed star connections to the Sun and Saturn aspect are worth considering too. Sun conjunct the unfortunate Saturnine star Deneb Kaitos from Cetus, and Saturn (8th/9th and 10th ruler) and opposing ascendant is joined to several saturnine stars by longitude. The most significant is Graffias, head of Scorpion, which can be a particularly destructive Mars/Saturn star – I have noticed this star featured in several charts I have worked on where situations were very violent or bodies were cut in two. Saturn is also currently joined to two unfortunate stars in Ophiuchus, (which probably explains why all the silly 13th sign nonsense is raising its head again right now). Asc-ruler Mercury is joined to Achernar from Eridanus “the river of tears”. Thanks for the additional observations. It’s a terrible event. I hope they can pinpoint the cause so any repeat can be avoided. After news reports on terrible events such as this one, I wonder if a study has been done on the individual charts of the passengers. Finality would have to be evident in each and every chart. Any exception would be extremely interesting. Also the chart of any passenger who missed the departure time or cancelled. I don’t know of such a study. It would be interesting if it were possible to gather all the data.